After 9-11, Stranger than Fiction started to have a new meaning… especially after Dr. Albert D. Pastore, (a penname for an independent researcher) meticulously pieced together ONLY mainstream media stories about the event. His goal was to deliver clues that would “lead to logical deduction” about the true culprits behind 9-11. The resulting book, Stranger Than Fiction, sent shock waves across the Internet. Since that time, countless numbers of reputable journalists, scientists and other professionals have joined the 9/11 Truth campaign. “Every news story about 9-11 that is contained in this book is true and easily verifiable,” states Dr. Pastore. Dr. Pastore is not an activist, he claims. He is only a truth-seeker. "But the funniest ‘conspiracy theory’ of all is that some Saudi caveman and his ‘network’ of Arab video game pilots managed to elude US investigators and pull off the most sophisticated intelligence operation in world history. 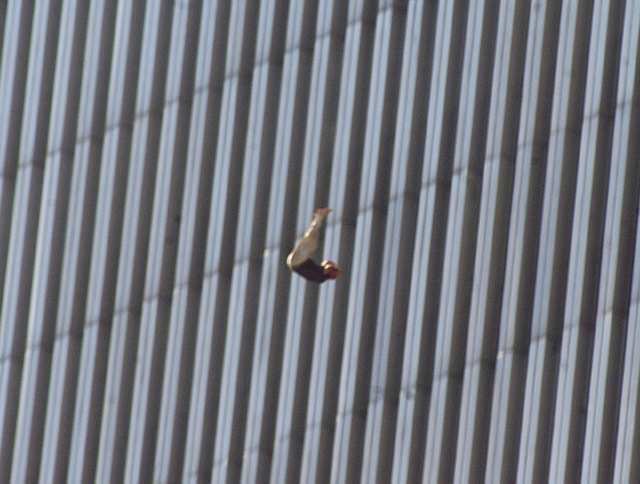 Photo of "The Falling Man," courtesy of theblackday.org.